If you have decided to implement tumor screening there are several additional decisions that need to be made as well as barriers that may need to be overcome. The following guide was designed to decrease the complexity of tumor screening implementation and increase the likelihood that implementation is successful.This guide was developed using the Consolidated Framework for Implementation Research (CFIR), review of the literature, as well as data from discussions with numerous stakeholders who have implemented screening. DIRECTIONS: Click on a question to view its answer. Click again to hide the answer. Click on underlined text to access additional information within the website. Although each institution is different, the key stakeholders often include genetic service providers, pathologists, gastroenterologists, GI oncologists, colorectal surgeons, and administrators [NOTE: gynecological oncologists are also key stakeholders if implementing endometrial cancer screening, but this guide is focused on colorectal screening]. Implementation is sometimes more effective if all stakeholders are engaged in the planning process, but you may be able to use this tool to suggest a plan that you think will work best for your institution and then obtain feedback from other key stakeholders. 2. How can we engage stakeholders in planning, implementing and/or supporting screening? Find individuals who will make this a priority and serve as a champion for tumor screening (one of these is probably you, but if you are not in a leadership position find someone who is and/or someone whose opinion other key stakeholders value). Provide screening recommendations from the Evaluation of Genomic Applications in Practice and Prevention (EGAPP) workgroup, National Comprehensive Cancer Network, and/or US Multi-Society Task Force on Colorectal Cancer. Show published evidence that tumor screening is cost effective. Elicit any barriers to implementing screening at your own institution and arm yourself with information for overcoming barriers. A CDC working group called the Evaluation of Genomics Application in Practice and Prevention (EGAPP) made an evidence-based recommendation in favor of universal tumor screening (UTS) [i.e., screening all newly diagnosed colorectal cancer patients]. National Comprehensive Cancer Network (NCCN) guidelines recommend screening all CRC patients OR all under age 70 and those 70 and up who meet Bethesda criteria. Limiting tumor screening to a subset of patients is referred to as criterion based screening (CBS) as opposed to UTS. CBS will identify more patients than if no routine screening were performed, but fewer than UTS [an estimated 25-75% of patients are missed depending on the screening criteria used]. 4. Which specimens to screen? 5. Who orders the screen? Setting up a system so screening is automatically done on all tumors has been described by some pathologists as the easiest approach for them and it saves them time. If the screening needs to be ordered, there is always the possibility that cases will be missed (less likely if there is some way to flag criteria in electronic medical records. 7. Should we perform automatic reflex testing to identify MLH1 promoter hypermethylation on screen positive tumors? Approximately 15% of sporadic tumors will demonstrate microsatellite instability (MSI), usually as a result of MLH1 promoter hypermethylation. If possible it is helpful to rule this out through additional testing on either all MSI-high tumors if MSI is used or on tumors with absence of MLH1 and PMS2 if IHC is used. The additional screening reduces the number of individuals who require counseling and therefore saves patients time and potential worry. Plus, it has been hypothesized that reducing the number who are seen by genetics but do not have Lynch syndrome makes it less likely that providers or patients will just assume that the positive screen was due to MLH1 promoter hypermethylation and therefore they may feel more of an urgency to follow-through with germline testing for those cases without evidence of hypermethylation. BRAF detects ~2/3 of colorectal tumors with hypermethylation. Thus more of the patients who do NOT likely have a germline mutation are detected if hypermethylation testing is performed. HOWEVER, many institutions already have BRAF mutation testing available at their institution, which makes this much more feasible and therefore they have chosen BRAF as the reflex testing method for colorectal tumors. [NOTE: BRAF testing does not work for endometrial tumors because very few have BRAF mutations]. 9. What about informed consent? Most institutions DO NOT require explicit informed consent for tumor screening. We have an ethics decision from one institution concluding consent is not necessary. 10. Where and to whom will positive results go? Screen positive results should be entered into the pathology report and flagged in the electronic medical record if possible so that the surgeon and other physicians working with the patient are aware of this result. [Several centers reported results getting lost in medical records and never being reported to patients]. Patients with MSI-high tumors (or abnormal IHC) have a better prognosis than other colorectal cancer patients and may be treated differently so this information can be useful in their care. It is also very helpful if all positive results are sent to a designated person at your institution who takes responsibility for ensuring that the patients and/or treating physicians are informed about results and offered genetic counseling and testing. 11. Who will be responsible for disclosing the positive results to patients? Several institutions have found it helpful to have a single person (with a back-up person) who is responsible for results disclosure. Having a genetic counselor do this has been helpful for some institutions because they already have the knowledge about Lynch syndrome and deal with this routinely. Plus, this takes the burden off physicians who have several other competing demands and may be unable to prioritize spending time discussing genetic implications. A few institutions where tumor screening has been successful have indicated that when genetic counselors (GCs) disclose screening results they indicate they are calling on behalf of Dr. _______ (the patient’s treating physician). Or in some cases GCs do not even call first, but rather they meet in-person with the patient immediately before or after the patient meets with the treating physician as part of routine follow-up appointment. However, these strategies are NOT feasible options at some institutions, making patient follow-through with counseling/germline testing more challenging. Nonetheless, some centers have been relatively successful when the treating physicians are in routine communication with genetic counselors who remind them which patients need follow-up and the physicians subsequently stress to the patient the importance of follow-up. 12. How will the patients be informed of their screening result? Several institutions report difficulty contacting patients and overcame this by meeting them at a follow-up post-op appointment for a brief pre-test counseling session to facilitate germline testing. This is not always possible, but the experience at OSU and Cleveland Clinic provide data to support the value of this approach. If this is not possible then it is critical that MDs stress the importance of follow-up to patients and this may require a high level of knowledge about Lynch syndrome among many different providers whose focus is not genetics. 13. How will patients with screen positive results receive appropriate counseling? Patients with a positive screen will need information about germline testing in order to make an informed decision and benefit from the information. Patients can either receive a full pre-test genetic counseling session or a shorter informed consent session with plans for a full genetic counseling session once results of germline testing are available. Sample letters for screen positive and screen negative patients are included in the implementation section of this website and are tailored according to whether IHC or MSI is used. Other useful information such as sample reports are also included in the implementation section. 14. What steps can you put into place to facilitate patient follow-through with genetic counseling and reduce patient barrier? 15. Where and to whom will negative screening results go? Results should be documented in the chart. Additionally, having an active tracking mechanism or someone review basic information about the patients with negative results can be helpful in identifying others for whom a genetics referral is appropriate if your center has time and resources available to do this. This improves quality of care and has resulted in the diagnosis of other hereditary cancer syndromes. 16. How and by whom will the patients be informed of negative results? Some centers generate a letter which informs the patient that their tumor was screened. This is useful in case they are asked about this in the future and it also provides an opportunity to explain that there may be other causes of hereditary cancer and encourage the patient to talk with their physician and/or make an appointment if they have “red flags” that would suggest genetic counseling is indicated. Other centers may have physicians mention the results to the patient and review whether a genetics appointment is warranted for other reasons (e.g. polyposis, strong family history, multiple primaries, early age at diagnosis). Simply putting results in the chart means that the opportunity to catch patients at high risk for other hereditary cancer syndromes may be lost. Most institutions we have talked to have altered their plans and this is to be expected. Regardless of how well you plan, it is unlikely that you can anticipate everything. Maintaining records on how the plan was executed including changes that are made (and on what dates) is critical when evaluating the outcomes. It may also be useful to assess the timeliness of follow-up and results disclosure. 19. How and who will record and track whether patients followed-through after a positive screen? Several institutions are NOT routinely tracking this information. Tracking is critical for ensuring or improving successful implementation. Providing stakeholders with feedback (particularly when a patient is identified with Lynch syndrome) has helped others to promote ongoing support for the screening program and has helped to win over some individuals who were skeptical or hesitant to perform screening in the first place. 20. Will someone be monitoring and tracking for any negative outcomes? Although few negative outcomes have been reported thus far, tracking of any perceived negative outcomes is critical to making improvements or averting issues in the future. 21. Under what circumstances and at what intervals will stakeholders reflect on the implementation process? By talking about the tumor screening process and discussing what seems to work and what does not, several centers have developed ways to streamline or improve their process. This should be done periodically, and whenever there are any changes in key personnel, challenges with patient follow-through, or any perceived negative outcomes. 22. How will you know if you are successful? 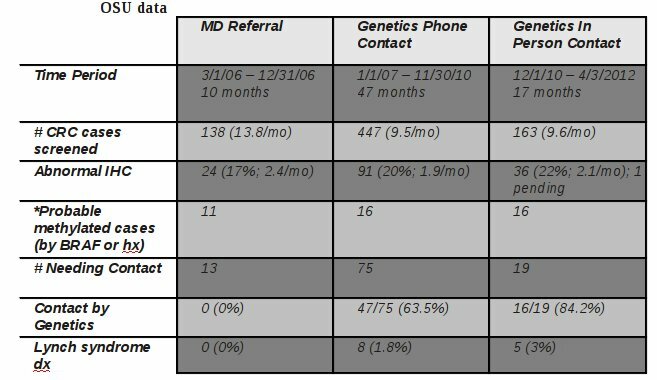 In addition to patient follow-through with genetic counseling and germline testing, other implementation outcomes have been measured at several different institutions and this data is relatively easy to collect and compare with expected outcomes based on data from large centers that have been doing screening for years. An excel spreadsheet has been created where you can track the number of screen positive patients you can expect, the number who will require counseling and germline testing (depending on your screening protocol), and the number of patients with Lynch syndrome who are expected to be identified. This can be used for quality control if the numbers are substantially different than expected (though if volumes are low, numbers could differ from what is expected simply due to chance). [NOTE: This excel spreadsheet can also be a useful tool to anticipate counseling volumes when preparing to start a screening program].